Systemic manifestations of women's subordination, such as the glass ceiling, are still a reality in organisations. Yet, the glass ceiling effect in the Global South is often conceptualised vis-à-vis (white) women's experience in ‘gendered organisations' and women's domestic role in the Southern societies. 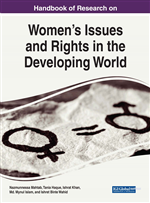 In this context, this chapter, based on a fieldwork research conducted in Sri Lanka's apparel industry, critically examines the glass ceiling effect of glass ceiling on women's career advancement in the Global South. Alongside the notion of ‘universal' patriarchy, it problematises the ‘universal' structure of the glass ceiling. And it shows that (un)doing factory women's collective identity—as lamai (little ones)—and the glass ceiling intermingle in the process of women's subordination in the apparel industry. The chapter concludes that, in the apparel industry, the role of managerial women —as well as of men in (un)doing factory women's collective identity—is crucial in keeping the glass ceiling in place. Despite some ‘success’ stories of (managerial) women, systematic manifestations of women’s subordination, such as the ‘glass ceiling’ or ‘sticky floor’—and their effect— are still a reality for women in the Global South (Kiaye & Singh, 2013; Ahmed & Maitra, 2015; Duraisamy & Duraisamy, 2016). The shift of the global assembly line from the North to the South— the ‘first global shift,’ which took place in the 1970s and 1980s as part of neoliberalisation of the global political economy (Harvey, 2005; Dicken, 2007) —had created job opportunities for (rural young) women in the South Asian region. As a result, during the 1970s and 1980s ‘traditionally’ unemployed (rural young) women in the region had become ‘productive labourers,’ mostly in the labour-intensive global apparel industry (Jayaweera, 2002; Khosla, 2009; Jayawardena, 2014). Even in ‘feminised’ industries like global apparel industry— such as we see in the case of Sri Lanka’s apparel industry, where 80 per cent of employees are (rural young) women— women remain a ‘subordinated group’ (Jayawardena, 2014): In fact, nearly all ‘top-rung,’ skilled jobs (on the shop floor) in the apparel industry (viz., factory managers, operations managers, and production executives) are occupied by men. On the contrary, ‘low-rung,’ unskilled jobs, such as the machine operators/seamstresses, quality checkers, and helpers, remain ‘feminine jobs’ (Jayawardena, 2010; Hancock et al., 2015). Therefore, as far as the subordination of women in the Global South is concerned, the case of Sri Lanka’s apparel industry is significant. Despite the role of the industry as the largest export income generator and one of the major job providers in Sri Lanka (Kelegama, 2005; Jayawardena, 2010; Central Bank of Sri Lanka, 2016), since its emergence in the late 1970s, the apparel industry has been characterised by gender segregated jobs. Yet, the gendered job segregation and women’s subordination in the industry cannot be viewed as mere organisational or industrial phenomena. In other words, the policies of the industry alone cannot be accused of ‘keeping women down,’ particularly on the shop floor of the industry. Rather, the job segregation and subordination are not only imbued with (un)doing factory women’s collective identity —as lamai (broadly meaning ‘little ones’) —in the industry. They are also embedded with many adverse socio-organisational forces and processes, such as sexual harassment, unattainable production targets and inhumane punishments at work in the industry, and gender prejudices in wider Sri Lankan society (Devanarayana, 1997; Hewamanne, 2008; Jayawardena, 2010, 2014, 2015; Hancock et al., 2015). Thus, these forces and processes, coupled with (un)doing factory women’s collective identity, tend to keep women as a subordinated group in the apparel industry and thereby, hinder their career development (Jayawardena, 2014, 2015).